Event of the year! 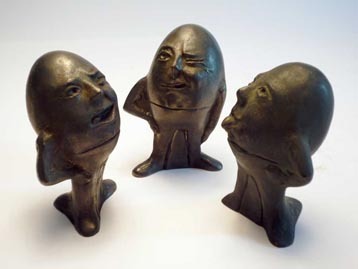 The arrival of the Egglings in 30 numbered copies! Discover the Egglings, and turn your own world and that of your friends upside down with this new amazing collection! Egglings -an underworld finally comes to light! A great deal has been written, over time, about Egglings. But they are everpresent -ready to erase every sentence. 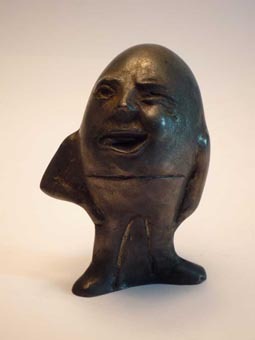 Spoiled, fanciful, full of strange convictions, narcissism and contempt of other Egglings, but also masterfully crafted by Michalis Kallimopoulos, they are on parade now in display cabinets at the Institute of Modern Greek Art in only 30 copies each. Selling price (incl. VAT): €150 each. Material: bronze. Weight: 1.4 kg. Height: 10.7 cm. in a recent publicity photo. The most bizarre and untamed fetish you have ever encountered, it will always be around to make sarcastic remarks about your house interior décor and all the things that happen -or don't happen- within its radius. Let us make their acquaintance! "Speaking also on behalf of the other two Egglings of the series, whom I represent, I wish you a lazy and profitable 2009." "In the office or in the living room, on a high, dark shelf with unimpeded view, so that I can keep an eye on who comes and goes." "Flowerpots, framed holiday & school pictures and collections of wedding memorabilia." Shark body type, eyes reminiscent of a 1960's taxman -the perfect holiday present. "If you are going to buy two Egglings only, take me and, there being no other alternative, the Eggling sticking out his tongue. The Swindler Eggling we dislike, he is too much of a fraud." "Next to the bowl of nuts." "Mothballs, hair combs, Eggling immitations and the Swindler Eggling." 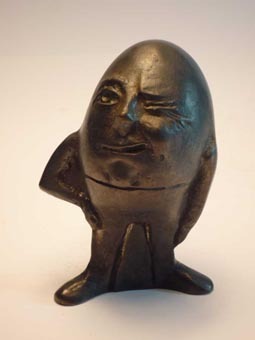 An Eggling with a point of view. "I rightfully won my place in the series of the visual artist Kallimopoulos, by comfortably defeating at the auditions the extremely unlikeable Eggling With His Hands In his Pockets. Everyone was overjoyed by my victory, as I am very popular; I am now ready for an international career." "Put me on the mantel over the fireplace, next to paper knives or the whiskey decanter, or on top of the electricity bills, so that the cat cannot scatter them away." "The cat, the Swindler Eggling, egg paints, beads and marbles, and the like." 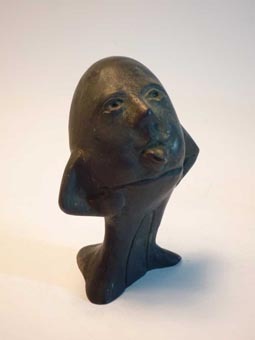 "Eggling Sticking Out His Tongue"
The perfect gift for stamp collectors. "I bought the Swindler Eggling for my daughter Louise"
Serafim Astropelekis, PhD, tobacco manufacturer, Kifissia.